All transactions are safe and secure with a reliable history in online purchasing behind each of our associates. 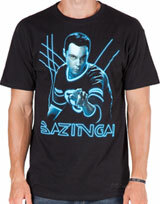 Buy the Tron Bazinga shirt to own Tron clothing and merchandise. We imagine that Sheldon would prefer a Tron tee over a Tron Legacy t-shirt, since he would argue that a sequel can never be as good as the original. Better yet, we're sure that he would approve of a Tron design that included his likeness. Wear this design as you hang the Tron poster art for the original 1982 movie featuring Clu/Kevin Flynn (Jeff Bridges) and Yori/Lora Baines (Cindy Morgan). This piece of clothing highlights the spectacular computer generated imagery that was unrivaled at the time of its release. In addition to the Tron Bazinga tee above, browse the Tron Clothing Gallery for more apparel like men's and women's clothes, kids shirts or hoodies.